Listen to "12. Best Practices to a Successful Off-Premise Program" on Spreaker. Best practices are one of the biggest challenges of the Off-Premise Paradigm. But that does not mean there can not be success. On this episode of The Takeout, Delivery, and Catering Show we meet Mike Axiotis, CFE, President & CEO, Lehigh Valley Restaurant Group, who is the franchise operator for Red Robin, covering Lehigh Valley, Philadelphia, and Harrisburg. Lehigh Valley is known for being a model for off-premise sales success. They have differentiated their channels with a unique transaction workflow, product selection, packaging, and centralized services. This has laid the groundwork for their successful off-premise franchise story. But, this is not the full story. This episode will explore how one franchise system launched an off-premise program, maintains their program, trains the staff, and trains the customer through marketing and other brand touch points designed to keep guests coming back for more. How to build and pair your wine selection with a food menu. The featured wines, Pinot Gris and Pinot Noir, are from Cooper's Hawk Winery and Restaurant. On this episode of Foodable’s Smart Kitchen and Bar, our master mixologist, Oscar Castaneda, explores flavor profiles with co-host, Adrianne Calvo—Author, Celebrity Chef, and Owner of Chef Adrianne's Vineyard Restaurant and Wine Bar in Miami, Fla. The experts discuss strategy and explore conversations a beverage director and a chef might have when deciding which wine pairs best with a food menu. The featured wines in this episode are Pinot Gris and Pinot Noir from Cooper Hawk’s Winery and Restaurant. Pairing a dish with your wine really depends on the flavor profile of the ingredients in a dish and not always just the protein at the center of the plate. In the spread that Chef Calvo prepared for Castaneda, flavor profiles are broken down and paired with each wine. For example, the white wine, Pinot Gris, pairs well with a light first course such as a summer salad. In this example, Castaneda tries a fresh crisp pear with the wine. “Why pair a pear with this wine instead of something else like an apple?” asks Castaneda. “An apple has higher acidity than the pear which will overpower the flavor. A pear is lightly sweet, has a little bit of a crunch, delicate fruit flavor,” says Chef Calvo. The acidity of the wine overpowers the pear flavor but still retains it in its backbone. Another alternative with fruit is a freeze-dried version. In this state, the flavor is concentrated and pairs well with the Pinot Gris. It’s an excellent wine that can go with many different dessert varieties as it can bring down the sweetness. In this two-episode series, Chef Calvo’s approach to the pairing was definitely out of the box and not something we have seen before. Want to see how day-old pizza paired with the Pinot Noir? Watch the full episode above to find out! Chef Adrianne Calvo demos Baja Fish Tacos & Fish Sandwich recipes using High Liner's award-winning beer battered seafood product line. The two dishes she covers in this episode are a Baja Fish Tacos (Cod) with chipotle lime mayo and a Crispy Beer Battered Fish Sandwich (Haddock) with homemade tartar sauce. On this episode of Foodable’s Smart Kitchen and Bar, our host Chef Adrianne will demonstrate for us two delicious recipes using High Liner’s award-winning beer battered seafood product line. The two dishes she covers in this episode are a Baja Fish Taco with chipotle lime mayo and a Crispy Beer Battered Fish Sandwich with homemade tartar sauce. 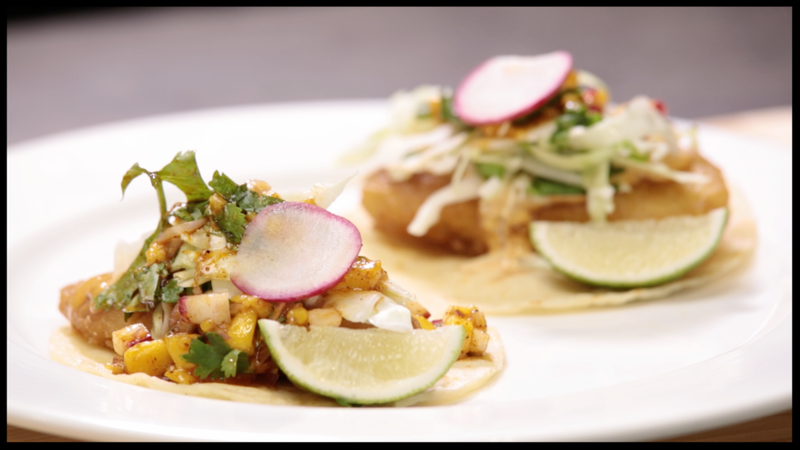 Although the beer battered fish does not need any added flavor enhancements Chef Adrianne pairs her fish tacos with a chipotle lime mayo that goes well with tacos, burgers and even sandwiches. She mixes equal parts of sour cream and mayo with chipotles in adobo, lime juice, honey, salt and pepper in a blender until a coral colored sauce is achieved. Then, Chef Adrianne fries the Cod Fillets with Corona® for about 3-5 minutes until golden-brown color. To make sure the dish is balanced and fresh, a slaw is prepared with green onions, cabbage, cilantro, lime juice, salt, and pepper topped with a mango-radice relish made with red onions, cilantro, chilli powder and olive oil to go over the cod. Last thing you want to do when creating this dish is to grill the tortillas so they are still warm when building out the fish tacos. To assemble, place two pieces of fish in the center of each warmed tortilla. Dollop mayo and then top with salsa. 4 Beer Yuengling® Battered Haddock Fillets, fried according to package directions. To make the slaw, toss cabbage and onion with 1 teaspoon kosher salt and lots of black pepper and set aside. Meanwhile, combine vinegar, mustard, mayonnaise, and sugar in a medium bowl and set aside for at least 15 minutes. Then, to make the tartar sauce combine mayonnaise, relish, onions, capers, sugar, and dijon mustard. Set aside. To finish slaw, pick up salted cabbage and onions in batches with your bare hands and squeeze out excess moisture. Transfer to bowl with dressing. Discard excess liquid. Toss slaw to combine and season to taste with more salt and pepper if desired. Toast buttered brioche buns on a flat top or oven. To serve, place a small pile of slaw on the bottom half of each bun. Top with a piece of fish and a dollop of tartar sauce. Close buns. Serve with extra slaw and sauce on the side.